Christine Jones Nov 2012 wrote "Topsoil is a product of photosynthesis. The more green plants you have for as much of the year as is possible, the more fertile and productive your land will be. " Soil minerals come from rocks but minerals don't make healthy topsoil. It's the organic matter and microbes that count. Sea sand is loaded with minerals but devoid of microbes. The aim of the management is to increase what is already there. Green plants act as conduits between the air and the soil. 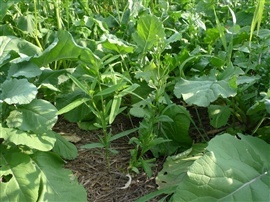 The cocktail cover crop will channel liquid carbon, increase microbial diversity, stimulate nutrient cycling and build new topsoil. 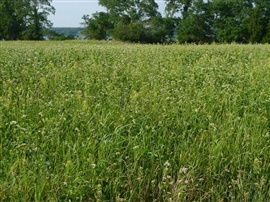 These factors inturn encourage the establishment of perennial grasses. Christine wrote " if you graze correctly (short duration, high intensity grazing with long recovery periods) perennial grasses will replace what ever else there is there, provided you NEVER use Glyphosate because it is lethal on the seedlings of perennial grasses. Herbicides act against the very thing you are trying to promote. The formation of fertile topsoil can be breathtakingly rapid once the biological dots have been joined and the sequestration/ mineralisation/ humification pathway has been activated. The positive feedback loops render the liquid carbon pathway somewhat akin to perpetual motion. You can almost see new topsoil forming before your eyes. The sun’s energy, captured in photosynthesis and channelled from above-ground to below- ground as liquid carbon, fuels the microbes that solubilise the mineral fraction. A portion of the newly released minerals enable rapid humification in deep layers of soil, while the remaining minerals are returned to plant leaves, facilitating an elevated rate of photosynthesis and increased levels of production of liquid carbon, which can in turn be channelled to soil, enabling the dissolution of even more minerals.